Harsanik - Proposal Tips To Make Her Say Yes! Whether you're a lucky fellow on the brink of proposing or an enamored girlfriend dreaming of the moment when he'll pop the question, it's never a bad thing to envision what your proposal will look like, is it? Where will you be? Think about a place that's meaningful to you both. It can be where your first date happened, the location you exchanged your first "I love yous," or even a place that will serve as a landmark for your love story in the future. The most important part is thinking of your fiancé to be and yourself, and the feeling you want to spark when you do get down on one knee. As the old saying goes, when you know, you know—not just about the person, but also about the location when you'll propose marriage! Think about this in three ways: intimate, semi-public, super public. There's no wrong choice here, but they are tied to your setting. Also consider whether or not you want family and friends as witnesses. For many, the nature of the action may be too overwhelming—caution, there will be tears of joy!—so think about how your current girlfriend would react, especially when there are others around sharing in the joyous moment. You're going through all this trouble of planning the perfect moment, so make sure there's at least someone around to snap a picture or a video. If you're flying solo, make sure to plan ahead and plant a camera at the location (don't forget to test it out! ), or swiftly ask a nearby guest, security guard or Good Samaritan to serve as your photographer. If you're looking to be super slick, you can hire a photographer who can follow you and your girlfriend around to capture before, during and after the moment. Just act natural and speak from the heart. As cliché as that may sound, it will bring about the most sincere, honest statements that will have her heart beating and tears flowing, no doubt. If you want to make an epic speech, go for it. If you want to keep it short and sweet, there's no harm in that. Remember, though, the key phrase at the very end... "Will you marry me?" 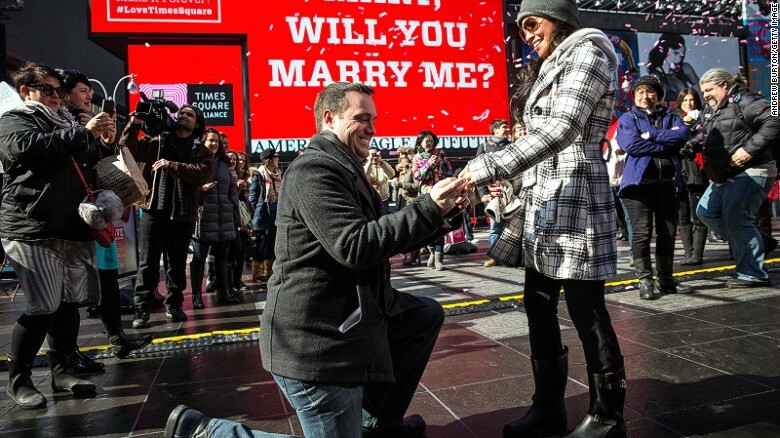 Over the years, we've shared lots of creative, special and fun proposal stories in our blog. We've featured a few of our recent favorites.